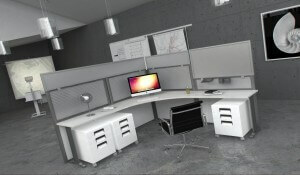 The new OBEX desk-mounted privacy panel has applications beyond the traditional workstation. These dividers can be installed front to back at regular intervals along a long table or bench style worksurface. That makes them ideal for testing environments. You can easily turn a built-in, standalone, or flip-top table into a testing station to host 3 or 4 job applicants at a time. Administer typing or data entry tests, ERI, Wonderlic, and other job candidate tests in these “pods” anytime. You can also set these up for use during new hire orientation and web-based onboarding. The panels are tall enough to provide visual privacy even in close quarters. They can be covered with acoustic fabric to dampen sound for added concentration. What makes this setup even more beneficial is that you don’t have to leave the panels up when you’re done. Removal is just as easy as installation. This means you can use both your office furniture and your office space for multiple purposes. Desk-top privacy panels take up little space in storage and are ready and waiting when you need them again. It’s not just employee training or applicant testing that could be enhanced by these panels. Think about this the next time you do open enrollment for workplace health insurance. Workers won’t have to worry about anyone seeing their personal identifying information such as SS#s and birth dates as they fill out forms. This approach may also help you keep employee’s private health data and other privileged information from accidental exposure. That’s important since more than 50% of identity theft cases have their source in the workplace. Workplaces are only one example of an environment where desk-top mounted panels will come in handy. Educational organizations will also find these dividers helpful for creating study and testing areas for students. Can you think of other applications for our new product? Let us know – we’re eager to learn!